Released as a beta just last month, Norway’s Opera Software has released Opera 11 for Windows, Linux, and Mac OS X. The new browser features stackable browser tabs—enabling users to organize tabs into logical groups rather than a splatter of items across the top of a window. Opera 11 also brings support for browser extensions—things like ad blockers, password managers, and translators—along with easier-to-understand security indicators on the address bar and “visual mouse gestures” that enable users to navigate and manage pages and tabs just my moving their mouse—no button-pushing required. Opera was actually the first browser to introduce tabs way back at the dawn of the 21st century. Opera 11 builds on that capability by enabling users to stack groups of browser tabs directly in the tab bar just by dragging tabs on top of one another; users can then access lower tabs in a stack via an arrow that slides hidden tabs out the side. Users can also drag tabs off a stack, and hover over a stack to see previews of tabs. The Opera 11 address bar features color codes to indicate the security level of a site (green for “trusted,” yellow for “secure,”, blue for Opera’s bandwidth-assisted “Turbo mode,” and grey for everything else). The address bar also features quick links for reporting fraudulent sites or malware. Opera’s browser extensions—which debuted with the Opera 11 beta—being the browser up to par with other mainstream browser offering add-ons—and a good selection of add-ons are already available for Opera 11, including translators, ad-blockers, and password managers. Opera apparently plans to keep supporting its earlier Widgets browser add-ons in addition to the new extensions. Other enhancements in Opera 11 include on-demand plug-in loading (which should help mitigate instability and resource consumption from things like Adobe Flash and Microsoft’s Silverlight), along with gesture-based mouse actions for navigating pages, opening and closing tabs, and more. 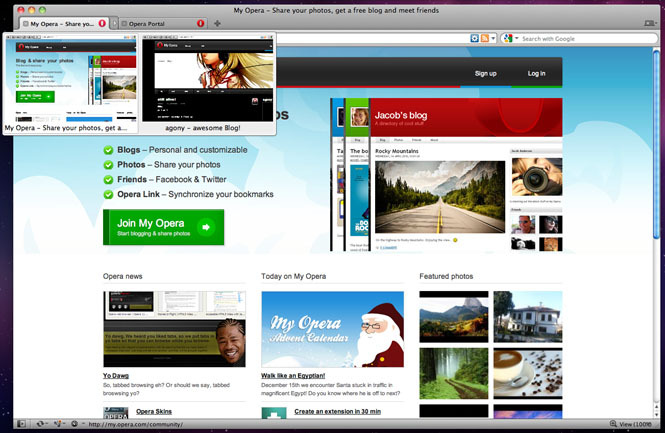 Opera 11 is available for free download now for Windows, Mac OS X, and Linux.